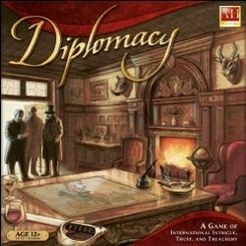 The NDSS library has added this game at the request of Mr Boudrea. Below you’ll find the Board Game Geek review of the game. This classic game of pure negotiation has taken many forms over the years. The first The Avalon Hill Game Co version has perhaps the widest release, but Avalon Hill Games, Inc. re-released the game in 1999, complete with a colorful new map and metal pieces. In 2008, Avalon Hill released a 50th anniversary edition with a new map and cardboard pieces representing the armies and navies.